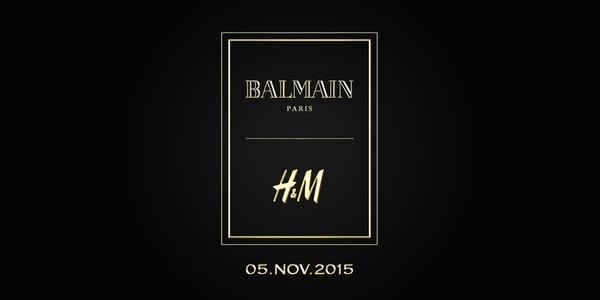 Get excited people, it’s the collaboration you’ve been waiting for; Balmain x H&M and it’s right around the corner. Olivier Rousteing took to the stage at the Billboard Music Awards in las Vegas last night to announce the collaboration with models Jourdan Dunn and Kendall Jenner showcasing designs from the upcoming collection. News of the forthcoming collaboration sent social media into a frenzy with the hashtag #HMBALMAINATION going stratospheric overnight and Rousteing himself posting a teaser trailer of the logo. H&M has brought us some of the coolest Designer/Highstreet collaborations out there including Alexander Wang, Stella McCartney, Versace & Karl Lagerfeld, but Balmain x H&M might just be it’s coolest yet. With support for Olivier Rousteing and the Balmain Army at an all time high (the Kardashians and Rihanna are huge fans), you’d better sharpen your elbows people and get ready for the drop of the year. Balmain x H&M hits stores and online November 5th but you’ll have to be quick, I predict this one selling out in about five minutes flat.